Performance and features you can depend on. A 18.5” display with essential features, an environmentally conscious design and rigorous reliability testing define the Dell 19 Monitor – E1916He. Screen performance: View your applications, spreadsheets and more on 19 inches of 1366x768 HD clarity, with 16.7 million colors, a color gamut of 85 percent and a 90° / 65° horizontal / vertical viewing angle. Convenient controls: Easily access buttons for power, brightness, contrast and customizable preset modes. On the monitor’s front panel. 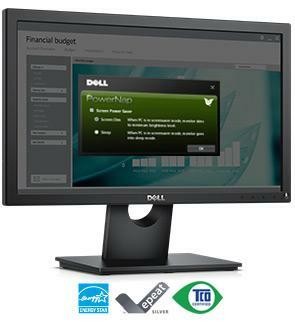 Your Dell 19 Monitor is just the start. Look for these great additions when finalising your purchase. Because it is backed by a 3-Year Limited Hardware Warranty* and Advanced Exchange Service*, you can purchase your Dell 19 Monitor – E1916He with confidence.